This is a great recipe to bring to parties – it’s always a hit! Combine cabbage, scallions and carrot in a large mixing bowl. Toss with dressing ingredients. This part of the salad can be made ahead to blend flavors. But don’t add the noodles (see below) or sunflower seeds until right before serving. Put uncooked ramen noodles inside a zippered plastic bag. Using a rolling pin, roll over the noodles to break into small pieces. Remove from plastic bag and mix into salad before serving. Add sunflower seeds right before serving as well. I love a good smoothie in the morning. Fruit, greens, protein, more fruit — it’s a wonderful quick breakfast solution that’s healthy too! Here are some of my favorite tips on making great smoothies that you (and hopefully your kids) will enjoy. 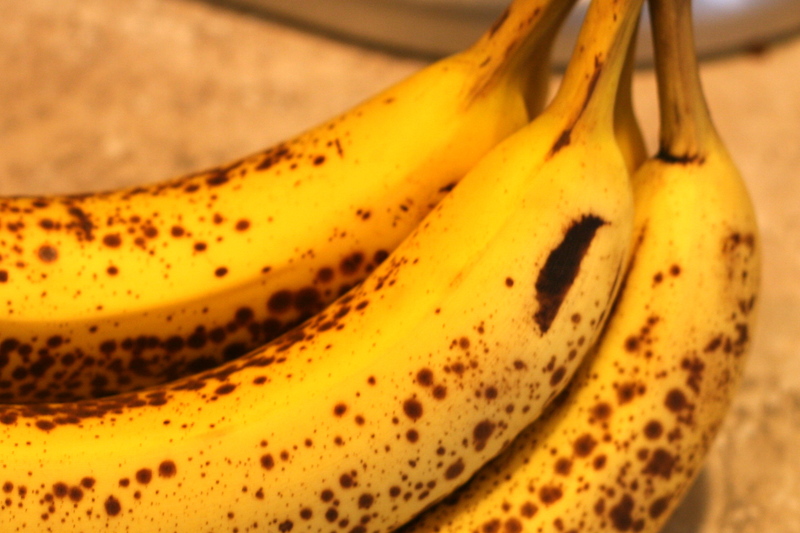 Frozen banana slices will thicken your smoothie and may keep you from needing to add ice. I buy large quantities of bananas and let them get just a little dark on the outside. This means they are really flavorful and delicious. Ready to slice and freeze! Then I slice the bananas into a gallon-size freezer bag. Just pile the slices from 5-6 bananas right into the bag. Then close up the bag, squeezing out as much air as you can. 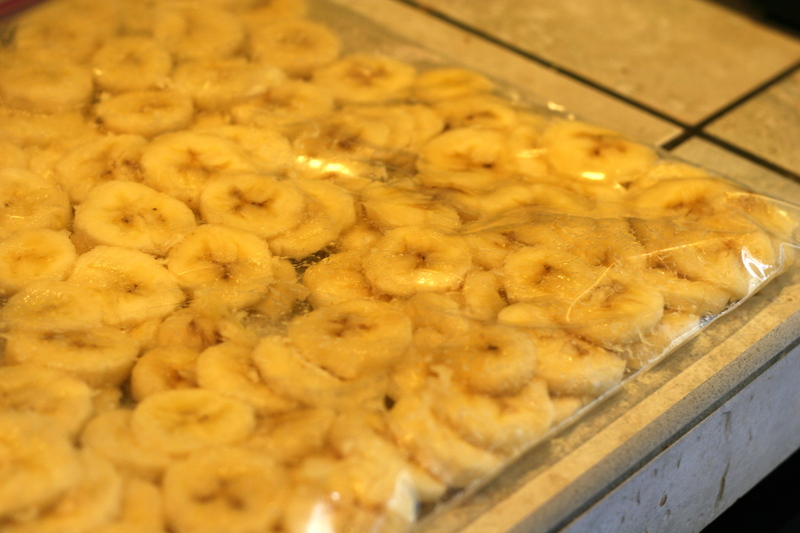 Flatten the bananas into a single layer, as much as possible. And toss into the freezer! 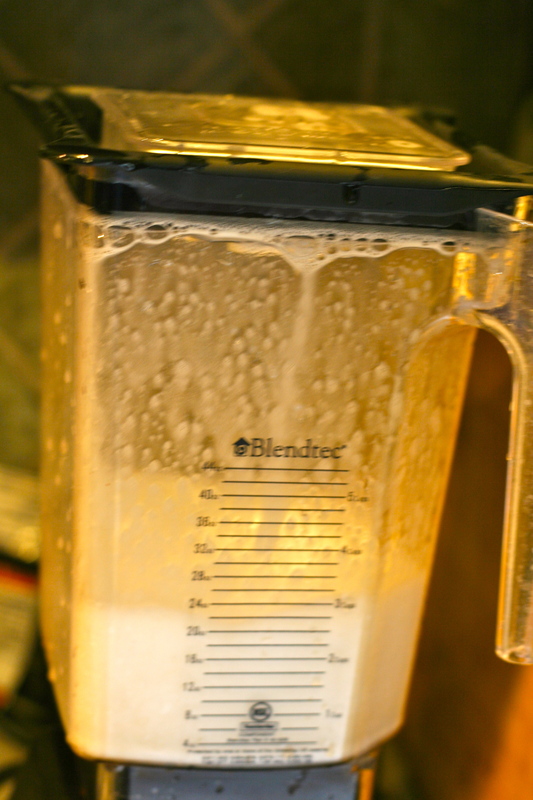 Heavy duty blenders like Blendtec & Vita-Mix are worth the money. I also use my Blendtec for lots of other kitchen tasks! I chose Blendtec because it was important to me that the blender fit under my kitchen cabinets. Vita-Mix blenders are a little taller, and have some different available features. Don’t mix red/orange fruits with greens if you want kids to drink the smoothie. The color combination makes a brown smoothie. It’s still tasty, but not as pleasing visually. My favorite source of information about green smoothies is Victoria Boutenko’s Green Smoothie Revolution book and Web site. Don’t forget to add herbs & extras like parsley, garlic or ginger. They have great health benefits and are so tasty too! Just a tablespoon of uncooked, whole oats will thicken your smoothie and make it more filling. Don’t add more than 2 tablespoons so as not to put a strain on your digestive system. My thoughts: I believe there’s many answers to this question – each person needs different foods prepared in different ways to satisfy their morning nutrition and energy needs. There are many days when I crave a smoothie. However, if my body is asking for a bowl of oatmeal or a tofu scramble, I find it’s important to listen to these messages. Q: How can I sneak extra nutrition into my smoothies? My thoughts: The nutrition Americans are most lacking is minerals, and the best source for these is greens. Adding greens like spinach, kale, parsley, etc. will increase nutrition benefits. I also like to include some “superfoods” like raw honey, raw cacao nibs and goji berries to enhance both flavor and nutrition in my smoothies. And honestly, every smoothie ingredient is so much more nutritious than your typical sugary cereal or fast-food breakfast. So if you have a smoothie instead, you are way ahead! Q: Is it ok to combine fruits and veggies? My thoughts: Generally, I stick to fruits and greens with the added nutritional boost items. 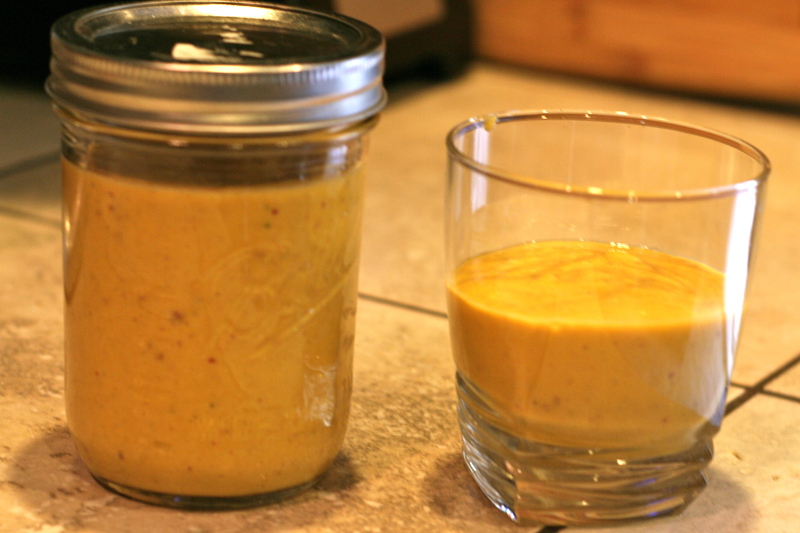 However, there are times when certain veggies can add a lot to a smoothie — try my Autumn Smoothie for example! Q: How can I get protein into my smoothies? There’s really no need to wash your blender in the dishwasher every time you use it. Just put 1-2 cups of hot water in with a drop of dishwashing liquid. Pulse for 30 seconds or so and rinse thoroughly. I put my blender in the dishwasher if my smoothie had something oily like almond butter in it, or if I’ve made 3-4 smoothies since I last dishwashered it. I hope this gives you some great new ideas! Please add comments with questions so I can keep helping improve your smoothies. Fruit, Squash & a few Extras! If smoothies make you think of summer berries and fruits, here’s a seasonal option for your autumn breakfast or snacking pleasure. Do you like pumpkin pie? Or sweet potatoes? Does fall inspire you to fill up on squash? Then this is the smoothie for you — it’s one part dessert, one part healthy and three parts delicious! 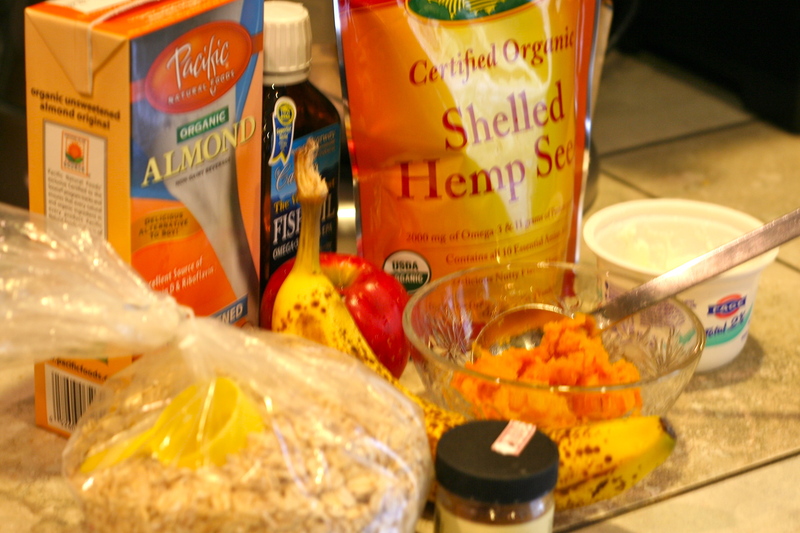 Put the following ingredients in your blender. Can be kept in a glass jar for up to 12 hours. Let me know what you think and if you have ideas or suggestions for enhancing the recipe! 2. Add yogurt, tomato, jalapeño relish. Blend until smooth. This may be done in a food processor, in a blender or with a fork.